View of the Earth as seen by the Apollo 17 crew traveling toward the moon. This image marked one of the first times humanity had seen its home in full. Fifty years ago this week, Sputnik Chief Designer Sergei Korolyov watched as a modified Russian missile launched into space from Kazakhstan's lonely steppes carrying a very special payload. Sputnik 1 ("traveling companion" in Russian) was about the size of a basketball and weighed about 180 pounds. It was equipped with two radio transmitters and four long antennas that broadcasted a constant beep while circling the Earth for 21 days. Sputnik's launch stunned the world and changed it, too. It heralded in dramatic fashion a new "space age," created an identity crisis in the United States, led to the creation of NASA and began a flurried race between the world's two superpowers to place a human on the moon. Sputnik touched all walks of life. For politicians, its launch provided a new and powerful way to stir up patriotism. Winning the space race was not only a matter of national security, they said, but of national pride. For engineers, the space age represented a new set of daunting technological hurdles to be overcome. The engineers were the group tasked with inventing machines capable of escaping Earth's gravity and reaching the moon, as well as ways to keep humans alive in space and to communicate with them from the ground. For people of a military mindset, Sputnik represented an awesome and frightening new way of waging war. The same technology needed to loft a satellite into space could also be adapted to hurl a nuclear warhead at your enemies from half a world away. For environmentalists, the photographs of our planet in full that came out of the space age were a powerful propaganda tool. 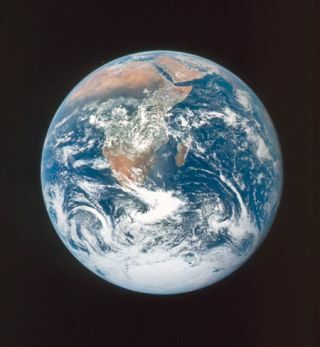 The "Blue Marble" image taken by the crew of Apollo 17 spoke volumes about Earth's fragility and the interconnectedness of life and humanity. But all of these things would come later. Arguably the first people to fully grasp Sputnik's significance and to exploit its technology were scientists for whom the beeping metal ball represented a radical new way of studying our planet and the universe. Scientists made their first major discovery of the space age a mere three months after Sputnik's launch. American scientist James Van Allen convinced engineers to strap a Geiger counter his team had designed to the first American satellite, Explorer 1, launched on January 31, 1958. The experiment confirmed the existence of Earth's magnetic field by detecting a doughnut-shaped region of high- energy particles encircling the planet. Scientists now know Earth has two such "Van Allen Belts" which can be hazardous to both satellites and astronauts. Sputnik's launch forced Americans to rethink the notion that they were the world's most technologically advanced nation. "Many people were flabbergasted that the Russians, of all people, could do it," recalled William Burrows, author of This New Ocean, a detailed chronicle of the space age. "The Communists bragged that they invented the airplane, radio, television, rockets and so on, so Americans made jokes that [they] probably also took credit for inventing baseball and bubble gum," Burrows said. "We laughed and ridiculed them. Then Sputnik. POW! They really did have muscle." What followed was an unprecedented push in the United States to educate the nation's youth in science and mathematics. In 1958, Congress passed the National Defense Education Act to provide scholarships for aspiring scientists, engineers and mathematicians. "Sputnik made everybody think about science and technology more seriously," said David Thompson, an astrophysicist at NASA Goddard Space Flight Center in Maryland. The U.S. government's push for scientific education was made easier in many ways by Sputnik. The satellite was a technological marvel that inspired an entire generation of students—and not just aspiring engineers. Some astronomers trace their interest in space to the Sputnik-era. "Everybody was going out to try to see these satellites that had just been launched and I went out and said 'You know, these other things in the sky are more interesting,'" Thompson said. "There are stars out there and planets.'" "I was a kid and it sounded very exciting," said Mario Livio, a senior astronomer at the Space Science Telescope Institute in Maryland. "At the time, the first name that I remembered for this was an 'artificial moon.' That of course had its own feelings that went with it: 'Humans have created their own artificial moon.'" For many scientists, Sputnik's greatest legacy is the space observatories such as Hubble that it paved the way for. Space telescopes "opened up new wavelength regimes or bettered the capabilities in a given regime by a factor of ten" compared to ground telescopes, Livio told SPACE.com. "The studies of the microwave background from space started with COBE and continued through to WMAP," said Steven Weinberg, a Nobel laureate in physics who works at the University of Texas in Austin. "That has really made cosmology into a precision science and given us our best evidence about inflation." Others think Sputnik's contributions to science are more subtle. The space age also encouraged scientists in all disciplines to entertain new ideas, said spaceflight historian Roger Launius, chair of the Division of Space History at the Smithsonian Institution’s National Air and Space Museum in Washington, D.C.
"We had no idea in the past until we started to explore space what the potential hazards as well as opportunities there were out there," Launius said. "When did the theory that the dinosaurs had a sudden mass extinction as a result of an asteroid emerge? Had we not flown in space, we would never have even considered that as a possibility."